A pile of pristine paperbacks—prizes for the evening's raffle—dominates a window seat in a San Francisco ballroom. Glass vats of caramels and licorice ropes gleam under floral chandeliers. At linen-clothed tables sprinkled with confetti, hundreds of people in fedoras and suits and evening dresses hunch over laptops tapping away at their novels . . . for seven hours. 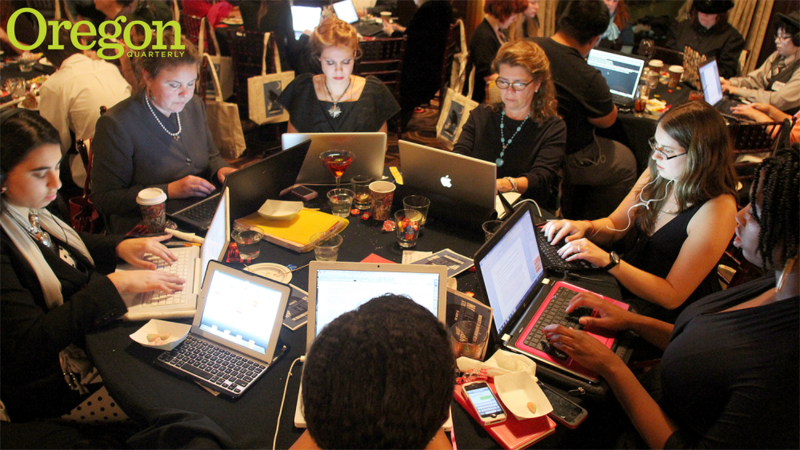 This is The Night of Writing Dangerously, a fundraising "write-a-thon" sponsored by the Berkeley, California–based Office of Letters and Light (OLL), a nonprofit organization that creates motivational events for writers. Program director Chris Angotti '04 mingles with the crowd, being of assistance when he can: Sure, you can have more licorice. Author portraits take place in that corner, and yes, if you write 50,000 words, you'll get to ring the giant bell. "Humor and whimsy define us," Angotti says of OLL staff members. "The vibe is super fun. We always serve milk and cookies at the end of the night." NaNoWriMo (NaNo for short) is the affectionate nickname given to National Novel Writing Month, which attracts more than 500,000 writers annually—whose collective effort is something of a literary moonshot, with a target of some 25 billion total words. It's caught on around the world. Egypt boasts 3,200 registered users. The Philippines has more than 4,000, while India exceeds 5,000. "What better way to spend a month than being creative?" Angotti asks. "Setting aside 30 days to bring out a story you have in your brain is amazing." He believes almost anyone can write a novel draft in 30 days with support from other writers. He and his coworkers manage online forums and Facebook and Twitter feeds designed to inspire would-be authors. The 24-year-old event is held each November; in recent years, NaNoWriMo's virtual Summer Camp has served writers each April and July. Remember that writing is one word after the other. Remember that once the words are there, editing is always possible. Stop! That's 15 minutes. Report back with your word counts, and let me know if you found a place for a fairy godstingray! While critics disparage the idea of penning anything worthy in a month, author Sara Gruen wrote a draft of Water for Elephants during NaNoWriMo. The book spent 12 weeks on the New York Times Best Seller List and became a feature-length film starring Reese Witherspoon. Erin Morgenstern wrote The Night Circus as a NaNo draft; the film version of her fantasy novel—a New York Times bestseller for seven weeks—is currently in production. In a post for NaNo's website, Morgenstern describes her struggle to craft the story during an intense month characterized by self-doubt. "The circus," she tells other writers, "was my variation on the wise and ancient NaNo wisdom:when in doubt, just add ninjas." Most NaNo participants don't end up with a publishing contract and a movie deal; for many, completing a 50,000-word manuscript is thrilling enough. Last November, UO freshman Amber Rose curled up with her laptop in a chair in the Science Library to work on her manga-inspired novel, Astro Girl, in conjunction with a course she was taking, "J-Pop Globalization," a freshman seminar in which students explore the influence of Japanese popular culture on the lives of Oregonians. "One of the best parts of NaNoWriMo," Rose says, "is reading the pep talks sent out to participants. One of Chris Angotti's pep talks was actually what kept my spirits up after my computer ate my 7,000 words. He said falling short of 50,000 words wasn't something to beat yourself up over and to keep writing." Angotti didn't intend to become an inspiration for authors worldwide. He just wanted to teach. He fell in love with literature while taking a UO English department course on Hemingway and Fitzgerald taught by Professor Emeritus George Wickes. "So many English classes feel theoretical," Angotti says. "Wickes talked about reading with so much love and affection and excitement—I hadn't really seen this before. It affected me as a reader, and as a writer." Angotti graduated from the UO with a degree in English and earned a master's degree from Teachers College of Columbia University in New York City. From there, he landed a teaching job. A few years later, he found himself rattling across the country in a U-Haul truck to be with his future wife, who'd been accepted to do graduate work at Stanford. 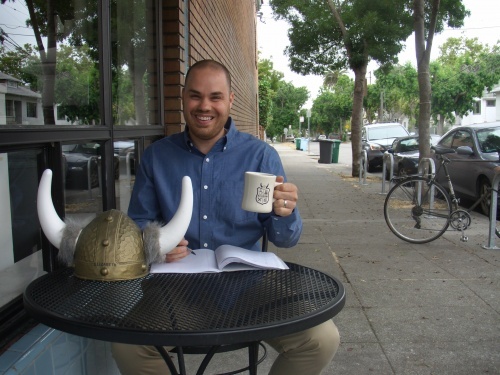 "I was sure I'd find a teaching job in California," he says. "That's not quite how it happened." As teaching jobs did not materialize, he replied to a Craigslist ad from the Office of Letters and Light. The initial job, director of the Young Writers Program, required him to maintain an online writing program for 35,000 K–12 students. Among the perks listed in the job description: "Casual office environment; fun-loving staff; next door to a bakery/café with the best chocolate chip cookies on the planet." "That's our tone," he says of the OLL at which he advanced to program director in 2012. "We're having a good time activating and empowering creativity." During April, July, and November, staff members help participants organize into online forums, clusters of digitally related individuals with common interests. A sojourn through the organization's colorful website reveals surprising subcultures: mystery authors over 40, campers with ADD, people who pen Christian teenage fantasy, and one group devoted to what they term "My Little Pony Fan Fiction." "We have writers who are superconfident teenagers," Angotti says, "and 40-year olds who never thought they could write a thing. People have told us that they've been despondent after the death of a loved one and wondered, 'What am I going to do?' They realize they can write as a conduit to get out their feelings. We've helped people in difficult spots." And, sometimes, in unfamiliar environments—which is how the "huge" UO campus seemed to freshman Amber Rose, who grew up in rural Lowell. She says participating in NaNoWriMo helped her to stay focused and set personal goals. "Like Chris," she says, "I'm getting a BA in English. Seeing what he's done with his degree makes me hope that I'll be able to do something just as great with my own." Angotti admits that he's put aside his own creative work while helping other writers. However, this year, he's been working on literary nonfiction that merges a love of writing with his passion for music. "It's about James Brown in the East Bay during the 1960s," he explains. "Brown was good friends with the owner of a record store down the street from my office. I found out about that, and it turned into a bigger investigation. When it's done, I'll submit it to independent weeklies," he says. "I feel like I'm finally coming into my own."